There’s a leopard in my kitchen! 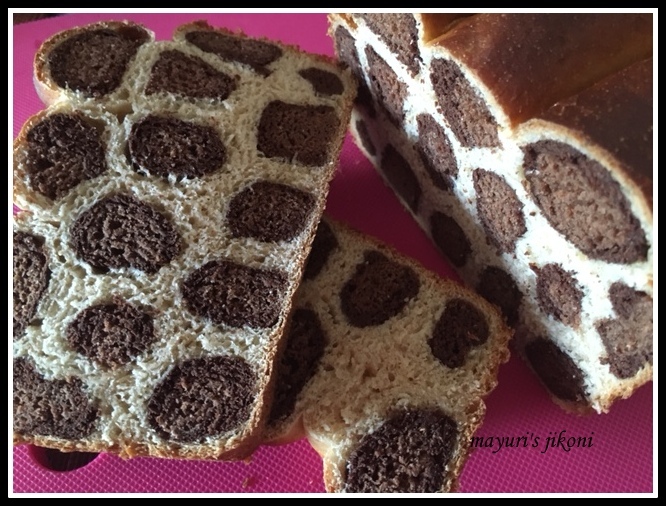 When Aparna suggested a leopard patch or leopard spots bread for our March challenge in We Knead to Bake group, I felt right at home. Leopards are not new to me, as I have seen them in the National Parks and at the Animals Orphanage in Nairobi. Years ago it was pretty easy to spot these animals in the parks but these days its pretty difficult because of poaching. Leopards are different from cheetahs. Leopards are nocturnal cats while cheetahs are diurnal. Leopards have shorter legs and more stockier whereas cheetahs have long legs and are slender to enable them to run fast. Now coming to the spots, cheetahs have black spots all over. Leopards have spots that are brown in the middle and black at the edges and are always in clusters, more like rosettes. Were pasted on for polka dots. New ones to buy if the old ones were lost. I remember teaching the little ones in my class the above silly poem by Spike Milligan whenever we had a jungle theme. Coming to the bread, getting the right shade of the light and dark brown was difficult as I don’t have black edible colour. Mixing the cocoa into the dough by hand took a bit of time as I had to knead it till there were no white patches showing. Yes, had to do the task by hand as the power disappeared. Overall, it was fun making this bread. extra dough for dusting the board or worktop. Mix cocoa and milk for both the light and dark brown dough and keep it on the side till required. Mix the flours, salt and sugar in a big bowl. Form a dough using both milk and water. Knead the dough for 10-15 minutes by hand or 10 minutes by machine till it is smooth and elastic. Divide the dough into half. Take one half part and roll it into a ball. Place it in an oiled bowl. Cover the bowl. That’s the white part. Divide the remaining half part into two equal parts. Take one part and add the light brown cocoa mixture (1½ tbsp + 1½ tbsp milk) to it. Mix and knead till you get an even coloured dough. Roll into a ball and place it in an oiled bowl. Take the remaining part of the dough and add the dark brown cocoa mixture (4 tbsp cocoa + 3tbsp milk). Mix and knead well till you get an even coloured dough. Roll the dough into a ball. Place it in a greased bowl. Cover the dough with cling film and let them rise for 1½ – 2 hours till the dough is double the size. Gently knead the dough to let out the air. Divide the dough, white, light brown and dark brown into 7 equal parts. Roll each part into a 8½ ” rope separately. Take a dark brown rope and flatten it slightly width wise. Place the light brown rope on it. Cover the light brown rope with the dark brown rolled dough. If the dark part does not cover the light one evenly, its alright. Take a white part and flatten it width wise. Place the dark rolled rope on it and cover it with the white dough. Must cover it properly. Repeat steps 18 to 23 with the remaining ropes, light encased by the dark and the dark by the white. Roll each newly formed rope into 17″ rope. Divide it into half so each part is 8½”. So now you will have 14 ropes. Grease a 9″X 5″ loaf tin lightly with butter. Place the ropes unevenly in the loaf tin. Cover the tin with cling film and let the dough rise for 1 hr till its double the size. Brush the top of the risen dough with milk. Bake the bread for 30 -35 minutes until the top is light golden yellow. Remove the dough from the pan and place it on a wire rack to cool completely before you slice it. I used Cadbury’s unsweetened cocoa. Using just 3 tbsp for the dark patch was not dark enough so I used 4 tbsp. Some recipes add edible black colour for the darker patch. Try and get the ropes end to end in the loaf tin for a more even ends. Some of my ropes were not touching the ends of the tin so the end product was uneven on the sides.